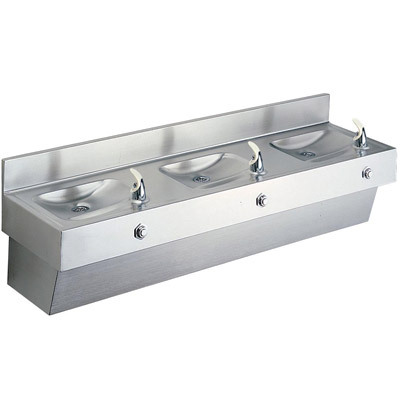 The Elkay EDF310C Drinking Fountain is a #18 gauge, type 304, nickel bearing stainless steel wall mounted multiple station unit and is designed to meet all sanitary codes. The Elkay EDF310C has stream splitter design basins with perforated grid strainers, hooded stream projectors have in-line flow regulators – 20 to 105 psi, and separate push-button controls are mounted on front. The Elkay EDF310C exposed surfaces are hand blended to a lustrous satin finish. Wall hanger furnished. The Elkay EDF310C is certified to be lead-free as defined by the Safe Drinking Water Act. Elkay Water Coolers are manufactured with a waterway system utilizing copper components and completely lead-free materials. The Elkay EDF310C waterways have no lead because all lead materials, such as leaded brass, have been removed. All joints are brazed using silver solder only. No lead solder is permitted. A strainer with an easily cleanable screen is provided to allow trapping and convenient removal of waterborne particulate of 140 microns and larger prior to their entry into the water cooler. 18 gauge, type 304, nickel bearing stainless steel.